Split drive anchors are a one-piece steel anchor with two sheared or "split" halves at the base which are pre-expanded to a specific size. Split drive anchors are available in flat head, pan and tie-wire head styles. Split drive anchors are a light-duty anchor for use with dead loads in concrete or stone. 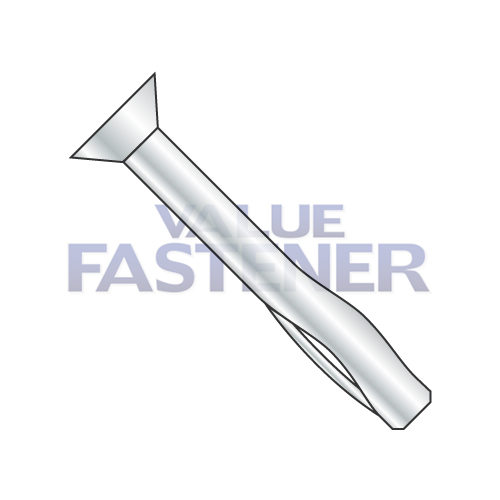 The opening in the base of the anchor is of a size which, when under pressure, the split drive anchor will try to regain, which creates the pressure on the inner walls of the hole, holding the fastening in place. The friction caused by this expansion can compensate for poor grades of concrete.